In 2012 the United Nations created the Day of the Girl to be celebrated each year on October 11. We are happy to be working in partnership with Daughter's Day and Grant MacEwan University, to present this special event. 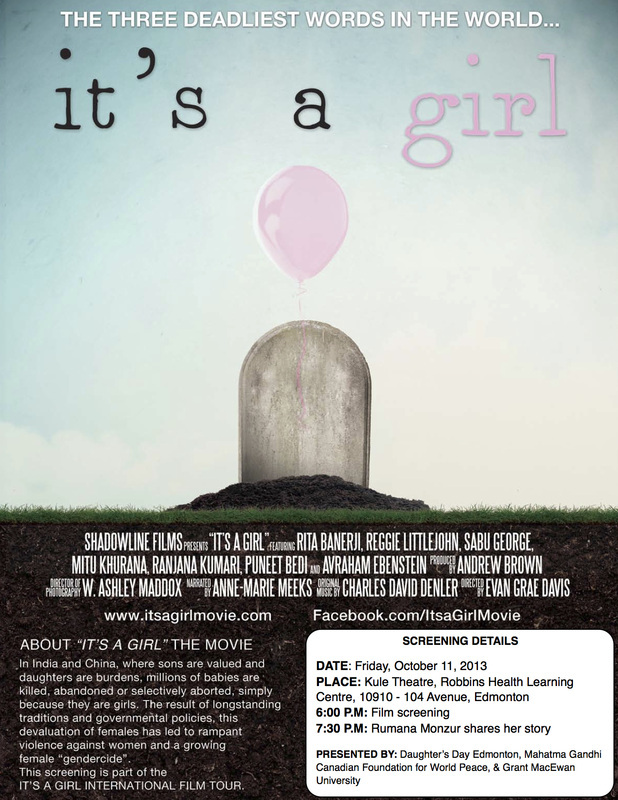 It's a Girl tells the stories of abandoned and trafficked girls, of women who suffer extreme dowry-related violence, of brave mothers fighting to save their daughters' lives and of other mothers who would kill for a son. Global experts and grassroots activists put the stories in context and advocate different paths towards change, while collectively lamenting the lack of any truly effective action against this injustice. 7:30 PM Rumana Monzur shares her story. Rumana Monzur will share her story in a discussion after the screening on October 11th. Rumana became known for the courage she demonstrated as she refused to let herself be crushed by violence and instead moved beyond her personal circumstances to speak out to promote full human rights for all women. Rumana was an Assistant Professor of Dhaka University, a Fulbright scholar and a graduate student in Political Science from University of British Columbia. In June, 2011, she was brutally attacked and blinded by her then-husband during a visit to her home country Bangladesh. Her husband assaulted her because she wanted to continue higher education in Canada against his wishes. Her case caught widespread media attention around the world due to ongoing domestic violence against women in Bangladesh and violation of the fundamental right of education. Rumana returned to Vancouver in July 2011 for further treatment but surgeries in both her eyes were unsuccessful, leaving not much hope for her to see ever again. Not letting this, or the threats of others who fear her out-spoken example on behalf of other women having their rights denied, she carries on as a mother (to a daughter), a student and teacher, and an inspiration, encouraging other women to leave abusive relationships. She earned her Masters degree in June of 2013 and is now enrolled in the Faculty of Law at UBC.